I’m going to start this review by saying that I really do not like Les Pauls. Sure, I love the tones I’ve heard on many different albums where Les Pauls have been used. In fact I’ll come out and say that the tone of a good Les Paul is an amazing thing to hear. My problem is they just do not sit right with me. The 24 3/4″ scale has always felt cramped to me, the body shape uncomfortable, and tune-o-matic bridges are not really my thing. The vintage style frets and neck width bother me a little too. Now that I’ve got that off my chest may I introduce you to the Gibson Les Paul Traditional. Thanks to my good friend Luigi I have been able to take the Les Paul Traditional out for a spin. In light of everything I just wrote, I’m going to come out and say that playing this guitar was almost a religious experience. 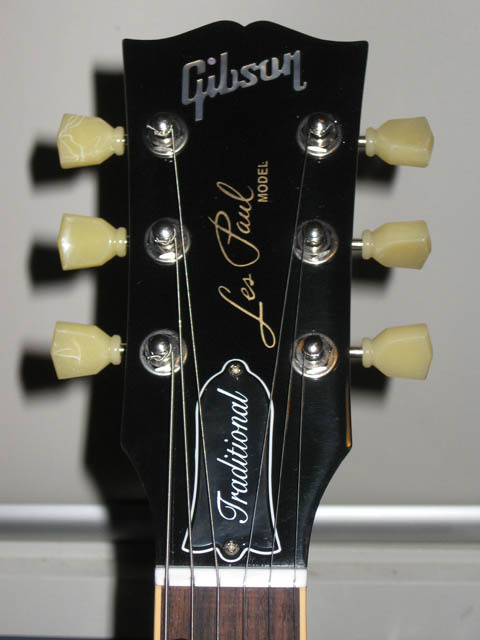 Les Paul’s are traditionally known for their huge tone, and the Les Paul Traditional sticks to ‘that’ traditional sound. It’s everything you would expect from Gibson’s classic. Beautiful thick tones with a ton of sustain. I believe that having an un-chambered body like the Gibsons’ of old is such a huge part of the Les Paul Traditional’s massive tone. Playing the guitar acoustically I could instantly tell that this was a well-made guitar. Gibson are infamous for putting out some, quite frankly, ordinary guitars over the last several years, so it was nice to hear that this guitar wasn’t one of them. The guitar was nice and loud, with a warm tone, and great sustain. The only thing I noticed that was a little funny sounding buzz. It turned out to be the bridge pickup vibrating a little. A little adjustment cured the guitar of that problem. Plugging the Les Paul Traditional into my Blackstar HT-5, I was greeted with a wonderful sound. The ’57 Classic pickup set are fantastic pickups for the Traditional. They really make the guitar sing on so many levels. They sound nice and full, whilst still maintaining articulation. One of the things that really impressed me with the ’57 Classic set is how well they performed huge hard rock and metal tones. Being a fairly vintage style pickup I was expecting them to be great for clean, and dirty classic and contemporary rock, but the tone I heard when I cranked my Blackstar HT-5’s dirty channel right up was monstrous! The Les Paul Traditional is one versatile guitar. It seems capable of any style of music that I cared to throw at it, and always begged for more. There was plenty of mojo about this guitar, and I knew that this is what a Les Paul should be all about. This guitar is a nicely put together instrument. Gibson have seen fit to have the guitars given the Plek treatment, and it shows. I would have preferred some lower action, but I think that Les Paul’s can be a little harder to get lower action due to their design. The intonation appeared to be right, and the fret work was quite nicely done, so the notes could really sing. The stain and clear on the body and neck is absolutely gorgeous and vibrant. The maple has a subtle flame to it, and looks very nice with the glossy clear coat. It’s a fairly even book match, but I would have liked it if the flame was a little more prominent. Others may prefer the subtle flame though, it’s nothing to hold against the guitar. There are a few minor niggles with the fit and finish though. I did notice a couple of ever so slight rough edges to the joins where the neck met the body. The bridge humbucker ring had a slight nick in it as well. The binding on the neck and body looked a little rough in a few places too. Overall this was a nicely put together guitar. Other than the little niggles I brought up earlier, which aren’t show stoppers, this guitar is one solidly built axe. The only thing that really bugged me about the Traditional was the vintage Kluson tuners. I hate not being able to adjust the tension of the tuning key, and they don’t hold tune as nicely as more modern designs. I would be upgrading them almost straight away with a nice modern locking tuner. So, I started off this review stating my dislike for Les Pauls. After playing the Les Paul Traditional my mind has changed somewhat. 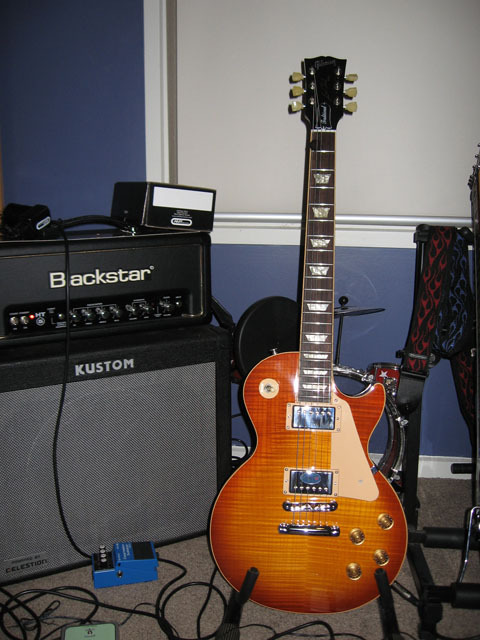 Play the right Les Paul, and it is extremely easy to forget about all the things you may not like about them. Because when you hear that wonderful massive tone you wont care how heavy, uncomfortable, cramped, thick the neck is, or what ever your beef with Les Pauls are. You will just want one. I certainly do now. 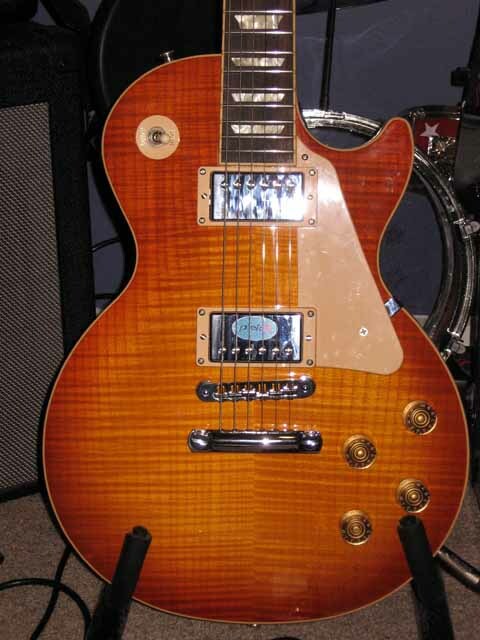 7 Responses to "Gibson Les Paul Traditional – review"
Hey there ‘Lone Phantom’, Site looks great man! Nice review on the gibson to BTW. Now, if I could only just play guitar and new some stuff about guitars I would go out and buy one. I think its very pretty. Les Pauls can be very hit and miss. Les Paul Traditionals are pretty good though in my experience. Great review! I wouldn’t go panning “dainty guitars” or whatever. My Ibanez Wizard necks are a godsend for my screwed up Carpal Tunnel Syndrome. They also have wider necks than the LPs which make my big hands happier too. The Traditional is an awesome guitar though. I’d love to have the cash to have one in my quiver for when I want that ‘Les Paul’ sound. No problems with the nut on the one I reviewed, you must have just lucked out in that respect. It was a amazing review, from this article i understand everything you need to know about this guitar and made me to buy it immediately. Thanks, I’m glad you liked the review. I really hated having to hand that guitar back, and I’m not even a Les Paul “guy”!